The Mailpile project has been soliciting feedback on the licensing of their product, but I couldn’t let one of the public responses go by without some remarks. Once upon a time, as many people may remember, a disinformation campaign was run by Microsoft to attempt to scare people away from copyleft licences, employing insensitive terms like “viral” and “cancer”. And so, over a decade later, here we have an article employing the term “viral” liberally to refer to copyleft licences. Now, as many people already know, copyleft licences are applied to works by their authors so that those wishing to contribute to the further development of those works will do so in a way that preserves the “share-alike” nature of those works. In other words, the recipient of such works promises to extend to others the privileges they experienced themselves upon receiving the work, notably the abilities to see and to change how it functions, and the ability to pass on the work, modified or not, under the same conditions. Such “fair sharing” is intended to ensure that everyone receiving such works may be equal participants in experiencing and improving the work. The original author is asking people to join them in building something that is useful for everyone. Unfortunately, all this altruism is frowned upon by some individuals and corporations who would prefer to be able to take works, to use, modify and deploy them as they see fit, and to refuse to participate in the social contract that copyleft encourages. Instead, those individuals and corporations would rather keep their own modifications to such works secret, or even go as far as to deny others the ability to understand and change any part of those works whatsoever. In other words, some people want a position of power over their own users or customers: they want the money that their users and customers may offer – the very basis of the viability of their precious business – and in return for that money they will deny their users or customers the opportunity to know even what goes into the product they are getting, never mind giving them the chance to participate in improving it or exercising control over what it does. From the referenced public response to the licensing survey, I learned another term: “feedstock”. I will admit that I had never seen this term used before in the context of software, or I don’t recall its use in such a way, but it isn’t difficult to transfer the established meaning of the word to the context of software from the perspective of someone portraying copyleft licences as “viral”. I suppose that here we see another divide being erected between people who think they should have most of the power (and who are somehow special) and the grunts who merely provide the fuel for their success: “feedstock” apparently refers to all the software that enables the special people’s revenue-generating products with their “secret ingredients” (or “special sauce” as the author puts it) to exist in the first place. It should be worrying for anyone spending any time or effort on writing software that by permissively licensing your work it will be treated as mere “feedstock” by people who only appreciate your work as far as they could use it without giving you a second thought. To be fair, the article’s author does encourage contributing back to projects as “good karma and community”, but then again this statement is made in the context of copyleft-licensed projects, and the author spends part of a paragraph bemoaning the chore of finding permissively-licensed projects so as to not have to contribute anything back at all. If you don’t mind working for companies for free and being told that you don’t deserve to see what they did to your own code that they nevertheless couldn’t get by without, maybe a permissive licence is a palatable choice for you, but remember that the permissive licensing will most likely be used to take privileges away from other recipients: those unfortunates who are paying good money won’t get to see how your code works with all the “secret stuff” bolted on, either. Once upon a time, Bill Gates remarked, “A lot of customers in a sense don’t want — the notion that they would go in and tinker with the source code, that’s the opposite of what’s supposed to go on. We’re supposed to give that to them and it’s our problem to make sure that it works perfectly and they rely on us.” This, of course, comes from a man who enjoys substantial power through accumulation of wealth by various means, many of them involving the denial of choice, control and power to others. It is high time we all stopped listening to people who disempower us at every opportunity so that they can enrich themselves at our expense. At least on certain parts of the Internet as well as in other channels, there has been a degree of excitement about the announcement by the BBC of a computing device called the “Micro Bit“, with the BBC’s plan to give one of these devices to each child starting secondary school, presumably in September 2015, attracting particular attention amongst technology observers and television licence fee-payers alike. Details of the device are a little vague at the moment, but the announcement along with discussions of the role of the corporation and previous initiatives of this nature provides me with an opportunity to look back at the original BBC Microcomputer, evaluate some of the criticisms (and myths) around the associated Computer Literacy Project, and to consider the things that were done right and wrong, with the latter hopefully not about to be repeated in this latest endeavour. As the public record reveals, at the start of the 1980s, the BBC wanted to engage its audience beyond television programmes describing the growing microcomputer revolution, and it was decided that to do this and to increase computer literacy generally, it would need to be able to demonstrate various concepts and technologies on a platform that would be able to support the range of activities to which computers were being put to use. Naturally, a demanding specification was constructed – clearly, the scope of microcomputing was increasing rapidly, and there was a lot to demonstrate – and various manufacturers were invited to deliver products that could be used as this reference platform. History indicates that a certain amount of acrimony followed – a complete description of which could fill an entire article of its own – but ultimately only Acorn Computers managed to deliver a machine that could do what the corporation was asking for. It is worth considering what the BBC Micro was offering in 1981, especially when considering ill-informed criticism of the machine’s specifications by people who either prefer other systems or who felt that participating in the development of such a machine was none of the corporation’s business. The technologies to be showcased by the BBC’s programme-makers and supported by the materials and software developed for the machine included full-colour graphics, multi-channel sound, 80-column text, Viewdata/Teletext, cassette and diskette storage, local area networking, interfacing to printers, joysticks and other input/output devices, as well as to things like robots and user-developed devices. Although it is easy to pick out one or two of these requirements, move forwards a year or two, increase the budget two- or three-fold, or any combination of these things, and to nominate various other computers, there really were few existing systems that could deliver all of the above, at least at an affordable price at the time. Perhaps the closest competitor, already being used in a fairly limited fashion in educational establishments in the UK, was the Commodore PET. However, it is clear that despite the adaptability of that system, its display capabilities were becoming increasingly uncompetitive, and Commodore had chosen to focus on the chipsets that would power the VIC-20 and Commodore 64 instead. (The designer of the PET went on to make the very capable, and understandably more expensive, Victor 9000/Sirius 1.) That Apple products were notoriously expensive and, indeed, the target of Commodore’s aggressive advertising did not seem to prevent them from capturing the US education market from the PET, but they always remained severely uncompetitive in the UK as commentators of the time indeed noted. Later, the ZX Spectrum and Commodore 64 were released. Technology was progressing rapidly, and in hindsight one might have advocated waiting around until more capable and cheaper products came to market. However, it can be argued that in fulfilling virtually all aspects of the ambitious specification and pricing, it would not be until the release of the Amstrad CPC series in 1984 that a suitable alternative product might have become available. Even then, these Amstrad computers actually benefited from the experience accumulated in the UK computing industry from the introduction of the BBC Micro: they were, if anything, an iteration within the same generation of microcomputers and would even have used the same 6502 CPU as the BBC Micro had it not been for time-to-market pressures and the readily-available expertise with the Zilog Z80 CPU amongst those in the development team. And yet, specific aspects of the specification would still be unfulfilled: the BBC Micro had hardware support for Teletext displays, although it would have been possible to emulate these with a bitmapped display and suitable software. Much has been made of the disappointment of Sir Clive Sinclair that his computers were not adopted by the BBC as products to be endorsed and targeted at schools. Sinclair made his name developing products that were competitive on price, often seeking cost-reduction measures to reach attractive pricing levels, but such measures also served to make his products less desirable. If one reads reviews of microcomputers from the early 1980s, many reviewers explicitly mention the quality of the keyboard provided by the computers being reviewed: a “typewriter” keyboard with keys that “travel” appear to be much preferred over the “calculator” keyboards provided by computers like the ZX Spectrum, Oric 1 or Newbury NewBrain, and they appear to be vastly preferred over the “membrane” keyboards employed by the ZX80, ZX81 and Atari 400. Some people claim that they owe nothing to the BBC Micro and everything to the ZX Spectrum (or, indeed, the computer they happened to own) for their careers in computing. Certainly, the BBC Micro was an expensive purchase for many people, although contrary to popular assertion it was not any more expensive than the Commodore 64 upon that computer’s introduction in the UK, and for those of us who wanted BBC compatibility at home on a more reasonable budget, the Acorn Electron was really the only other choice. But it would be as childish as the playground tribalism that had everyone insist that their computer was “the best” to insist that the BBC Micro had no influence on computer literacy in general, or on the expectations of what computer systems should provide. Many people who owned a ZX Spectrum freely admit that the BBC Micro coloured their experiences, some even subsequently seeking to buy one or one of its successors and to go on to build a successful software development career. Some commentators seem to consider the BBC Micro as having been an unnecessary diversion from the widespread adoption of the IBM PC throughout British society. As was the case everywhere else, the de-facto “industry standard” of the PC architecture and DOS captured much of the business market and gradually invaded the education sector from the top down, although significantly better products existed both before and after its introduction. It is tempting with hindsight to believe that by placing an early bet on the success of the then-new PC architecture, business and education could have somehow benefited from standardising on the PC and DOS applications. And there has always been the persistent misguided belief amongst some people that schools should be training their pupils/students for a narrow version of “the world of work”, as opposed to educating them to be able to deal with all aspects of their lives once their school days are over. What many people forget or fail to realise is that the early 1980s witnessed rapid technological improvement in microcomputing, that there were many different systems and platforms, some already successful and established (such as CP/M), and others arriving to disrupt ideas of what computing should be like (the Xerox Alto and Star having paved the way for the Apple Lisa and Macintosh, the Atari ST, and so on). It was not clear that the IBM PC would be successful at all: IBM had largely avoided embracing personal computing, and although the system was favourably reviewed and seen as having the potential for success, thanks to IBM’s extensive sales organisation, other giants of the mainframe and minicomputing era such as DEC and HP were pursuing their own personal computing strategies. Moreover, existing personal computers were becoming entrenched in certain markets, and early adopters were building a familiarity with those existing machines that was reflected in publications and materials available at the time. Despite the technical advantages of the IBM PC over much of the competition at the beginning of the 1980s, it was also substantially more expensive than the mass-market products arriving in significant numbers, aimed at homes, schools and small businesses. With many people remaining intrigued but unconvinced by the need for a personal computer, it would have been impossible for a school to justify spending almost £2000 (probably around £8000 today) on something without proven educational value. Software would also need to be purchased, and the procurement of expensive and potentially non-localised products would have created even more controversy. Ultimately, the Computer Literacy Project stimulated the production of a wide range of locally-produced products at relatively inexpensive prices, and while there may have been a few years of children learning BBC BASIC instead of one of the variants of BASIC for the IBM PC (before BASIC became a deprecated aspect of DOS-based computing), it is hard to argue that those children missed out on any valuable experience using DOS commands or specific DOS-based products, especially since DOS became a largely forgotten environment itself as technological progress introduced new paradigms and products, making “hard-wired”, product-specific experience obsolete. Not everything about the BBC Micro and its introduction can be considered unconditionally good. Choices needed to be made to deliver a product that could fulfil the desired specification within certain technological constraints. Some people like to criticise BBC BASIC as being “non-standard”, for example, which neglects the diversity of BASIC dialects that existed at the dawn of the 1980s. Typically, for such people “standard” equates to “Microsoft”, but back then Microsoft BASIC was a number of different things. Commodore famously paid a one-off licence fee to use Microsoft BASIC in its products, but the version for the Commodore 64 was regarded as lacking user-friendly support for graphics primitives and other interesting hardware features. Meanwhile, the MSX range of microcomputers featured Microsoft Extended BASIC which did provide convenient access to hardware features, although the MSX range of computers were not the success at the low end of the market that Microsoft had probably desired to complement its increasing influence at the higher end through the IBM PC. And it is informative in this regard to see just how many variants of Microsoft BASIC were produced, thanks to Microsoft’s widespread licensing of its software. Nevertheless, the availability of one company’s products do not make a standard, particularly if interoperability between those products is limited. Neither BBC BASIC nor Microsoft BASIC can be regarded as anything other than de-facto standards in their own territories, and it is nonsensical to regard one as non-standard when the other has largely the same characteristics as a proprietary product in widespread use, even if it was licensed to others, as indeed both Microsoft BASIC and BBC BASIC were. Genuine attempts to standardise BASIC did indeed exist, notably BASICODE, which was used in the distribution of programs via public radio broadcasts. One suspects that people making casual remarks about standard and non-standard things remain unaware of such initiatives. Meanwhile, Acorn did deliver implementations of other standards-driven programming languages such as COMAL, Pascal, Logo, Lisp and Forth, largely adhering to any standards subject to the limitations of the hardware. However, what undermined the BBC Micro and Acorn’s related initiatives over time was the control that they as a single vendor had over the platform and its technologies. 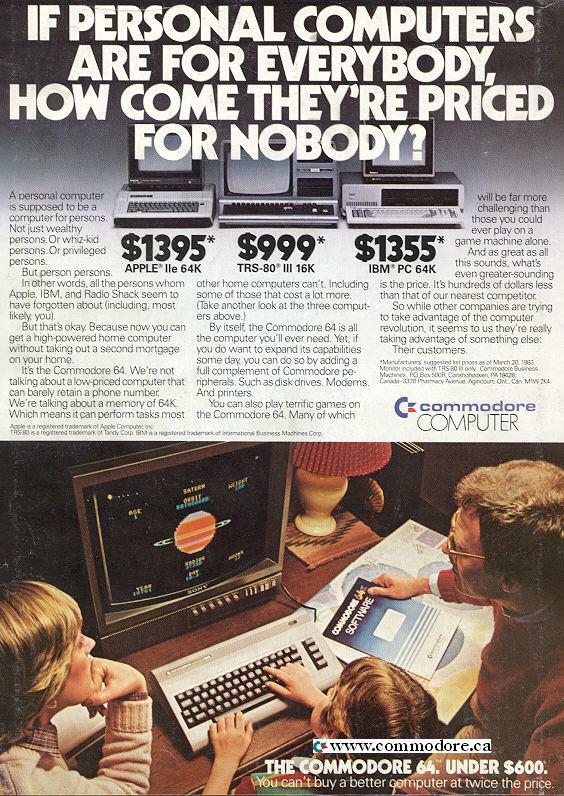 At the time, a “winner takes all” mentality prevailed: Commodore under Jack Tramiel had declared a “price war” on other vendors and had caused difficulties for new and established manufacturers alike, with Atari eventually being sold to Tramiel (who had resigned from Commodore) by Warner Communications, but many companies disappeared or were absorbed by others before half of the decade had passed. Indeed, Acorn, who had released the Electron to compete with Sinclair Research at the lower end of the market, and who had been developing product lines to compete in the business sector, experienced financial difficulties and was ultimately taken over by Olivetti; Sinclair, meanwhile, experienced similar difficulties and was acquired by Amstrad. In such a climate, ideas of collaboration seemed far from everybody’s minds. Since then, the protagonists of the era have been able to reflect on such matters, Acorn co-founder Hermann Hauser admitting that it may have been better to license Acorn’s Econet local area networking technology to interested competitors like Commodore. Although the sentiments might have something to do with revenues and influence – it was at Acorn that the ARM processor was developed, sowing the seeds of a successful licensing business today – the rest of us may well ask what might have happened had the market’s participants of the era cooperated on things like standards and interoperability, helping their customers to protect their investments in technology, and building a bigger “common” market for third-party products. What if they had competed on bringing technological improvements to market without demanding that people abandon their existing purchases (and cause confusion amongst their users) just because those people happened to already be using products from a different vendor? It is interesting to see the range of available BBC BASIC implementations and to consider a world where such building blocks could have been adopted by different manufacturers, providing a common, heterogeneous platform built on cooperation and standards, not the imposition of a single hardware or software platform. Back then, as Richard Stallman points out, proprietary software was the norm. It would have been even more interesting had the operating systems and the available software for microcomputers been Free Software, but that may have been asking too much at the time. And although computer designs were often shared and published, a tendency to prevent copying of commercial computer designs prevailed, with Acorn and Sinclair both employing proprietary integrated circuits mostly to reduce complexity and increase performance, but partly to obfuscate their hardware designs, too. Thus, it may have been too much to expect something like the BBC Micro to have been open hardware to any degree “back in the day”, although circuit diagrams were published in publicly-available technical documentation. But we have different expectations now. We expect software to be freely available for inspection, modification and redistribution, knowing that this empowers the end-users and reassures them that the software does what they want it to do, and that they remain in control of their computing environment. Increasingly, we also expect hardware to exhibit the same characteristics, perhaps only accepting that some components are particularly difficult to manufacture and that there are physical and economic restrictions on how readily we may practise the modification and redistribution of a particular device. Crucially, we demand control over the software and hardware we use, and we reject attempts to prevent us from exercising that control. The big lesson to be learned from the early 1980s, to be considered now in the mid-2010s, is not how to avoid upsetting a popular (but ultimately doomed) participant in the computing industry, as some commentators might have everybody believe. It is to avoid developing proprietary solutions that favour specific organisations and that, despite the general benefits of increased access to technology, ultimately disempower the end-user. And in this era of readily available Free Software and open hardware platforms, the lesson to be learned is to strengthen such existing platforms and to work with them, letting those products and solutions participate and interoperate with the newly-introduced initiative in question. The BBC Micro was a product of its time and its development was very necessary to fill an educational need. Contrary to the laziest of reports, the Micro Bit plays a different role as an accessory rather than as a complete home computer, at least if we may interpret the apparent intentions of its creators. But as a product of this era, our expectations for the Micro Bit are greater: we expect transparency and interoperability, the ability to make our own (just as one can with the Arduino, as long as one does not seek to call it an Arduino without asking permission from the trademark owner), and the ability to control exactly how it works. Whether there is a need to develop a completely new hardware solution remains an unanswered question, but we may assert that should it be necessary, such a solution should be made available as open hardware to the maximum possible extent. And of course, the software controlling it should be Free Software. As we edge gradually closer to September and the big deployment, it will be interesting to assess how the device and the associated initiative measures up to our expectations. Let us hope that the right lessons from the days of the BBC Micro have indeed been learned! I had the opportunity over the holidays to browse the January 2015 issue of “Which?” – the magazine of the Consumers’ Association in Britain – which, amongst other things, covered the topic of “technology ecosystems“. Which? has a somewhat patchy record when technology matters are taken into consideration: on the one hand, reviews consider the practical and often mundane aspects of gadgets such as battery life, screen brightness, and so on, continuing their tradition of giving all sorts of items a once over; on the other hand, issues such as platform choice and interoperability are typically neglected. Perhaps due to the formula behind such articles in Which? and similar arenas, some space is used to describe the benefits of committing to an ecosystem. Above the “expert view” describing the hassles of switching from a Windows phone to an Android one, the title tells us that “convenience counts for a lot”. But the article does cover problems with the availability of applications and services depending on the platform chosen, and even the matter of having to repeatedly buy access to content comes up, albeit with a disappointing lack of indignance for a topic that surely challenges basic consumer rights. The conclusion is that consumers should try and keep their options open when choosing which services to use. Sensible and uncontroversial enough, really. But sadly, Which? is once again caught in a position of reacting to technology industry change and the resulting symptoms of a deeper malaise. When reviewing computers over the years, the magazine (and presumably its sister publications) always treated the matter of platform choice with a focus on “PCs and Macs” exclusively, with the latter apparently being “the alternative” (presumably in a feeble attempt to demonstrate a coverage of choice that happens to exist in only two flavours). The editors would most likely protest that they can only cover the options most widely available to buy in a big-name store and that any lack of availability of a particular solution – say, GNU/Linux or one of the freely available BSDs – is the consequence of a lack of consumer interest, and thus their readership would also be uninterested. Such an unwillingness to entertain genuine alternatives, and to act in the interests of members of their audience who might be best served by those solutions, demonstrates that Which? is less of a leader in consumer matters than its writers might have us believe. Refusing to acknowledge that Which? can and does drive demand for alternatives, only to then whine about the bundled products of supposed consumer interest, demonstrates a form of self-imposed impotence when faced with the coercion of proprietary product upgrade schedules. Not everyone – even amongst the Which? readership – welcomes the impending vulnerability of their computing environment as another excuse to go shopping for shiny new toys, nor should they be thankful that Which? has done little or nothing to prevent the situation from occurring in the first place. Thus, Which? has done as much as the rest of the mainstream technology press to unquestioningly sustain the monopolistic practices of the anticompetitive corporate repeat offender, Microsoft, with only a cursory acknowledgement of other platforms in recent years, qualified by remarks that Free Software alternatives such as GNU/Linux and LibreOffice are difficult to get started with or not what people are used to. After years of ignoring such products and keeping them marginalised, this would be the equivalent of denying someone the chance to work and then criticising them for not having a long list of previous employers to vouch for them on their CV. Noting that 1.1-billion people supposedly use Microsoft Office (“one in seven people on the planet”) makes for a nice statistic in the sidebar of the print version of the article, but how many people have a choice in doing so or, for that matter, in using other Microsoft products bundled with computers (or foisted on office workers or students due to restrictive or corrupt workplace or institutional policies)? Which? has never been concerned with such topics, or indeed the central matter of anticompetitive software bundling, or its role in the continuation of such practices in the marketplace: strange indeed for a consumer advocacy publication. At last, obliged to review a selection of fundamentally different ecosystem choices – as opposed to pretending that different vendor badges on anonymous laptops provide genuine choice – Which? has had to confront the practical problems brought about by an absence of interoperability: that consumers might end up stranded with a large, non-transferable investment in something they no longer wish to be a part of. Now, the involvement of a more diverse selection of powerful corporate interests have made such matters impossible to ignore. One gets the impression that for now at least, the publication cannot wish such things away and return to the lazy days of recommending that everyone line up and pay a single corporation their dues, refusing to believe that there could be anything else out there, let alone usable Free Software platforms. Elsewhere in the January issue, the latest e-mail scam is revealed. Of course, a campaign to widen the adoption of digitally-signed mail would be a start, but that is probably too much to expect from Which? : just as space is dedicated to mobile security “apps” in this issue, countless assortments of antivirus programs have been peddled and reviewed in the past, but solving problems effectively requires a leader rather than a follower. Which? may do the tedious job of testing kettles, toasters, washing-up liquids, and much more to a level of thoroughness that would exhaust most people’s patience and interest. And to the publication’s credit, a certain degree of sensible advice is offered on topics such as online safety, albeit with the usual emphasis on proprietary software for the copy of Windows that members of its readership were all forced to accept. But in technology, Which? appears to be a mere follower, suggesting workarounds rather than working to build a fair market for safe, secure and interoperable products. It is surely time for Which? to join the dots and to join other organisations in campaigning for fundamental change in the way technology is delivered by vendors and used throughout society. Then, by upholding a fair marketplace, interoperability, access to digital signature and encryption technologies, true ownership of devices and of purchased content, and all the things already familiar to Free Software and online rights advocates, they might be doing their readership a favour after all. For noen måneder siden skrev jeg om avgjørelsen foretatt av ledelsen til Universitetet i Oslo å innføre Microsoft Exchange som gruppevareløsning. I teksten viste jeg til kommentarer som handlet om Roundcube og hvorfor den løsningen ikke kunne brukes i fremtiden hos UiO. Nå etter at universitetets IT-avdeling publiserte en nyhetssak som omtaler SquirrelMail, får jeg muligheten til å grave opp og dele noen detaljer fra mine samtaler med talspersonen tilknyttet prosjektet som vurderte Exchange og andre løsninger. At Roundcube hadde mangler “ved innføringen”, mens Roundcube hadde vært i bruk i noen år før den tvilsomme prosessen ble satt i gang for å vurdere e-post og kalenderløsninger. At forbedringene kom tilfeldigvis for sent for å påvirke ledelsens beslutning å innføre Exchange. I fjor sommer, uten å dele prosjektgruppens påstander om mangler i Roundcube direkte i offentlighet, hørte jeg med andre om det fantes kjente mangler og forbedringspotensial i Roundcube i dette området. Var UU virkelig noe som hindret utbredelsen av Roundcube? Jeg satte meg inn i UU-teknologier og prøvde noen av dem med Roundcube for å se om situasjonen kunne forbedres med egen innsats. Det kan hende at det var store mangler i Roundcube tilbake i 2011 da prosjektgruppen begynte sitt arbeid – jeg velger ikke å hevde noe slikt – men etter at slike mangler ikke kom frem i 2012 i prosjektets sluttrapport (der Roundcube faktisk ble anbefalt som en del av den åpne kandidaten), må vi konkludere at slike bekymringer var for lengst borte og at universitetets egen webmail-tjeneste, selv om den er tilpasset organisasjonens egen visuelle profil (som kan ha noe å si om vedlikehold), var og fortsatt er tilgjengelig for alle brukere. Hvis vi våger å tro at utdraget ovenfor forteller sannheten må vi nå konkludere at ledelsens beslutning fant sted lenge før selve prosessen som skulle underbygge denne beslutningen ble avsluttet. Og her må vi anse ordene “ledelsen besluttet” i et annet lys enn det som ellers er vanlig – der ledelsen først drar nytte av kompetanse i organisasjonen, og så tar en informert beslutning – med å anta at, som tidligere skrevet, noen “måtte ha” noe de likte, tok beslutningen de ville ta uansett, og så fikk andre til å finne på unnskyldninger og et grunnlag som virker fornuftig nok overfor utenforstående. Det er én sak at en tilstrekkelig og fungerende IT-løsning som også er fri programvare svartmales mens tilsynelatende upopulære proprietære løsninger som Fronter når ikke opp slik at problemer rapportert i 2004 ble omtalt igjen i 2012 uten at produsenten gjør noe vesentlig mer enn å love å “jobbe med tilgjengelighet” fremover. Det er en annen sak at bærekraftige investeringer i fri programvare virker så fremmed til beslutningstakere hos UiO at folk heller vil snu arbeidsdagen til den vanlige ansatte opp-ned, slik utskiftningen av e-postinfrastrukturen har gjort for noen, enn å undersøke muligheten til å foreta relativt små utviklingsoppgaver for å oppgradere eksisterende systemer, og slippe at folk må “[stå] på dag og natt” i løpet av “de siste månedene” (og her viser vi selvsagt ikke til folk i ledelsen). At ansatte i IT-avdelingen fikk munnkurv omkring prosessen og måtte forlange at deler av beslutningsgrunnlaget ikke når frem til offentligheten. At “menige” IT-ansvarlige må løpe hit og dit for å sørge for at ingen blir altfor misfornøyd med utfallet til en avgjørelse hverken de eller andre vanlige ansatte hadde vesentlig innflytelse på. At andre må tilpasse seg preferansene til folk som egentlig burde hatt ingenting å si om hvordan andre utfører sitt daglig arbeid. Alt dette sier noe om ledelseskulturen og demokratiske tilstander internt i Universitetet i Oslo. Men sannheten kommer langsomt frem.